Ureflex is a flexible clear coat in a 3 part system which can be applied by a spray gun or manually brushed. 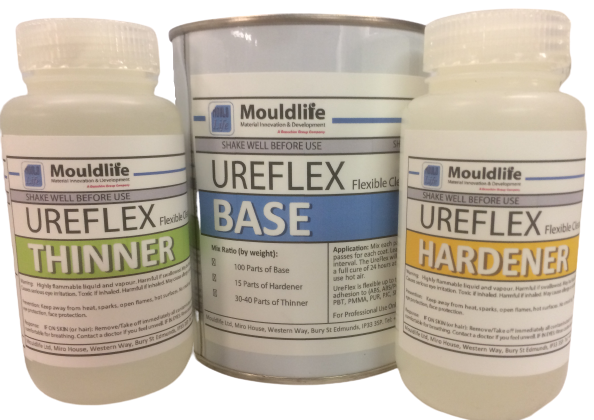 UreFlex is flexible up to temperatures of 180◦c. It has direct adhesion to (ABS, ABS/PC, PPO/PC, alloy PPO/PS, EPOXY, PA, PBT, PMMA, PUR, PJC, SMC/BMC). Application: Mix each part to the correct ratio. Spray 2 to 3 passes for each coat. Leave 5 to 10 minutes between each interval. The UreFlex will be touch-dry after 30 minutes and has a full cure of 24 hours at room temperature. For faster drying use hot air. Coverage – 11 sqm per litre.